Until a few years ago I bet that not many off us had come across Macarons, which took the world by storm back in 2012. They were everywhere…green ones, pink ones, chocolate ones, vanilla ones…I set about trying to discover what they were and why they were so popular. I decided the best way to do this was to make them myself as I wasn’t prepared to pay upwards of $3.00 per macaron and was battling to understand what all the fuss was about. Now they’ve even popped up on our local service station’s coffee treat menu! MacDonald’s even sell them in their cafe! So a while ago I set about trying to find the secret to this little treasure. My first discovery was that some people refer to them as Macaroons (pronounced mah-kah-roons) while others refer to them as Macarons (pronounced mah-kah-rohns).Was this just a spelling and pronunciation error or was there actually more to this little tale where my knowledge quite obviously didn’t extend far enough? I had to find out. It seems that both are cookies, but look and taste very different. However, they are distant cousins and begin with the same ingredients and then once you add a few different things along the way, Ta Da! You end up with two very different cookies. History tells us, whether factually or according to popular myth, the macaron, despite being most popular with the French, was created circa 1533 in Italy by the chef of Catherine de Medici, who brought her sweet tooth indulgence to France when she married the French king. Since macarons bare a striking resemblance to the Italian cookie amaretti, and share the same origin as the Italian word “macaroni”, this version of history sounds good to me! A few tips from me? Don’t trust the first recipe you come across unless it is the one below…I’ve tried a few and I found this one the simplest and easiest to follow. The almond flour really does need to be sieved a few times to remove any lumps and bumps so if you have a food processor, use it! Pushing it through a sieve can become very tiring and takes a while so process, process and process again before sieving. My final verdict: They are delicious and if you manage to get them right, the satisfaction of having the “frilly feet” and smooth top far outweigh the pleasure of eating it. I find them very rich and can’t quite be bothered to make them more than I would absolutely have to. But…having conquered this dainty morsel, I move on to other challenges, wishing you the best of luck. Preheat the oven to 140ºC, and position 2 racks in the lower section of the oven. Line 2 rimmed baking sheets with parchment paper. If you have time, draw 2-3cm circles on the back of each sheet, spacing the circles at least 2cm apart. If your almond meal is very coarse, grind it with the icing sugar in a food processor until fine. Sift the almond meal-powdered sugar mixture twice through a mesh sieve. If making a chocolate version, add cocoa to the dry ingredients prior to sieving. Place egg whites in a glass bowl and begin to beat on medium-high. When the eggs are frothy, gradually add castor sugar 1 tablespoon at a time until fully incorporated. Continue to beat the egg white mixture until glossy and stiff peaks form when you lift the beaters. Gently stir in the vanilla extract (and any food colouring/gel if making different colours). Be careful to not overbeat the meringue. Add half of the sifted almond mixture, and gently fold it into the meringue using a flexible silicone spatula. Lift from the bottom, up around the sides, and toward the middle, being careful to not overagitate the meringue and lose too much air. Once the almond mixture is predominantly incorporated, add the second half and repeat the folding motion – sounds very technical, but folding is different to stirring so try to follow this to leave as much air in as possible. When the almond mixture is just incorporated, you will need to transform the batter into the appropriate texture…not using a magic wand…I know this step sounds a bit strange, but bare with me. Using the flat of the spatula, “punch” down into the center of the batter, then scrape more batter from the sides to the center, and punch again. You will need to repeat this 10-15 times (or more, depending on your arm strength and the beginning texture of your batter) until the batter slowly and continuously drips back into the bowl when you scoop it up with the spatula. Think of the consistency of molten lava. For the best results, punch the batter a few times, check the consistency, then punch a few more times, etc. Do not make the batter too runny or the macarons won’t rise as they should, and you could end up with oil stains on the surface. When you’re happy that you’ve achieved the right texture, pour the batter into a pastry bag fitted with a half inch/1 cm tip. Now if you followed the directions properly and drew the circles on the back of the parchment paper, well done! If not, turn the paper over before piping as you don’t want to end up with pencil marks on your gorgeous macarons. Pipe a disc shape over the circle – I tend to place the tip in the centre of the circle, slightly lifted off the paper and squeeze gently with constant pressure. That way the disc forms beautifully. Give a small flick when you release the pressure to break the stream of batter mixture. You may have a little point on top of the disc, either tap it gently with your finger to flatten it or leave it and it should disappear over the course of the next few steps. Once all piping is finished, hold the baking sheet in both hands and rap it firmly on the counter two or three times. Now people…please! Not WRAP, rap – meaning bang. Some comments following the original recipe leave a person speechless…”what do I wrap it with?” No wrapping, just rapping (and not the edgy stoccato lyric kind either…bang people, BANG!). OK, back to the case in point – this smooths out the tops and helps form the “pied” or frilly foot on the bottoms of the macarons. Allow the piped macarons to dry, uncovered, for at least 15 minutes. 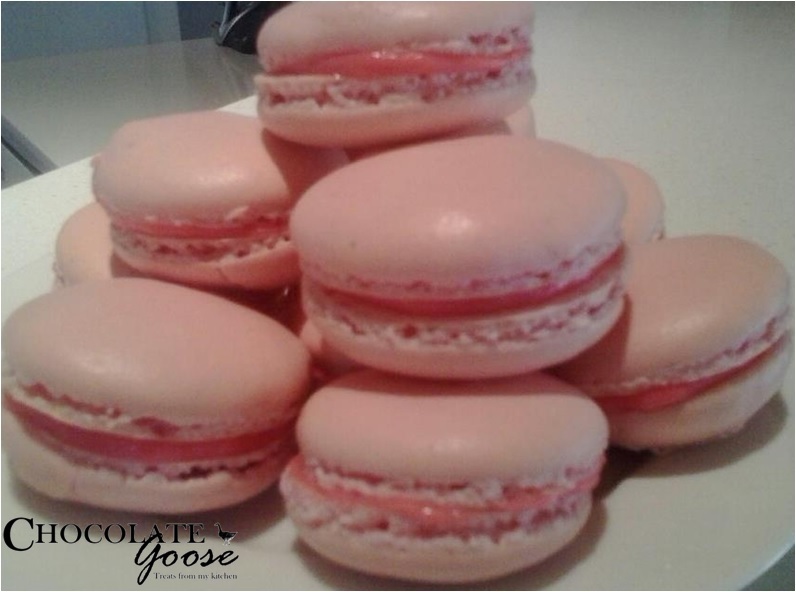 The macarons should form a very thin, smooth crust where, if you tap it lightly with your finger, the batter will not stick to your finger. If after 15 minutes the batter is still sticky, let it dry longer. It may take up to an hour on humid days, but hopefully not as by now, you’ll have worked up an appetite and be wanting to taste these little morsels of sweet delight. Place both baking sheets in the oven and bake for 15 – 18 minutes. After the first 2 minutes, open the oven to allow any excess humidity to escape – then close it again. Halfway through, swap oven racks and rotate the sheets for even baking. The macarons are done when they are baked all the way through and the shells are just hard. Take care to not underbake (insides will still be mushy) or overbake (tops will begin to brown). Remove them from the oven and cool on the baking sheets placed on a wire rack.